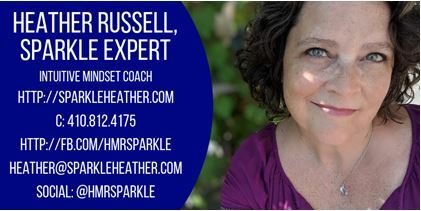 ​Heather Russell, aka the Sparkle Expert, is passionate about helping women (especially moms), who struggle with the feeling that they’ve lost their sparkle - that inner essence that makes them unique. Heather helps them to rediscover the feeling of being the sparkling superstar of their own lives by implementing simple and absolutely life-changing mindset hacks, utilizing energy healing, and receiving personalized support along the journey. Heather offers online coaching, courses, Forest Reiki ™, and lots of love in her Facebook communities. She loves leading her team of amazing women with Touchstone Crystal by Swarovski.